Developed Academic Computing and Networking Services website applications and content. Customized Canvas and Blackboard course management systems and created support websites. Developed data management tools for Canvas and Blackboard using C#, REST APIs and databases. Developed applications for managing Shibboleth service providers and InCommon certificates. Developed Echo360 video capture system support website and account request form. Developed Institutional Research, ISTeC, Telecommunications and Mobile Apps websites. Developed the Colorado Encyclopedia website and administrative tools using Drupal 7. Managed the Libraries Web Team and the design, development, maintenance and evaluation of the 5000-page Colorado State University Libraries website. 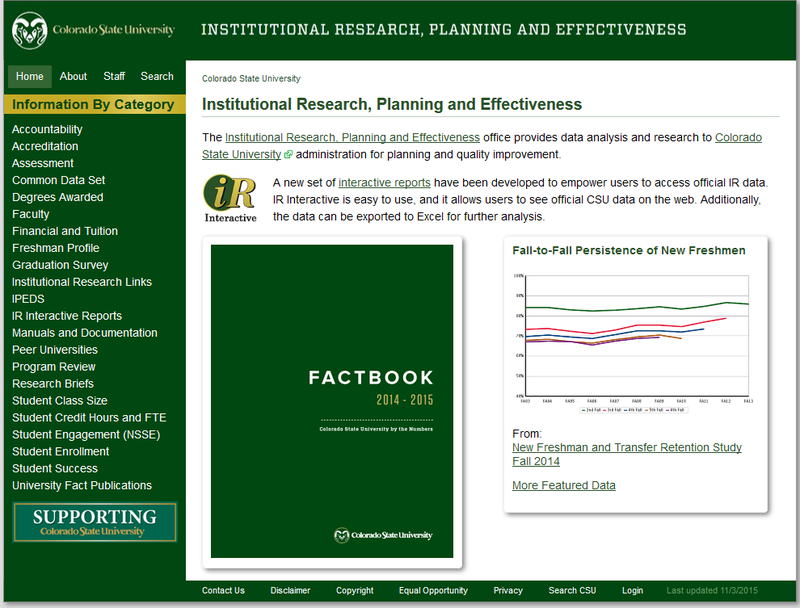 Conducted major redesigns of the Libraries site in 2009-2010 and 2005-2006. Developed Discovery, a library search tool based on VuFind. Administered library CMS, digital repository, wikis and blogs. Designed archives and digital collections subsites (e.g. water, posters, wildlife, carnations). Designed other subsites (e.g. staff intranet, staff wiki, Writers on the Plains). Developed and maintained library Web applications and track Web statistics. Maintained 500 Web pages, including 30 pages of web design and development tips. Conducted Web authoring workshops for Libraries and university staff. Developed course websites, including syllabi, lecture notes and coursework.